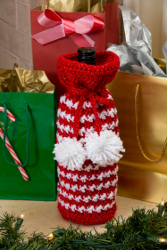 Greet your host or hostess this year with a festive and useful Christmas crochet pattern like this Holiday Spirits Bottle Bag from Red Heart Yarn. This is an excellent Christmas gift to make because it's one that you can be sure whoever receives it will be able to use again. It's also great practice for crocheters, especially if you love to make pom poms. Nothing will look warmer on the holiday table than this thoughtful crochet bottle bag. Bag measures 12" (30 cm) tall and 6" (15 cm) wide. RED HEART® Holiday®: 1 ball each 9040 Red/Silver A and 140 White/Silver B. Split lock stitch marker, yarn needle, 3" (8 cm) x 3" (8 cm) cardboard. Gauge: 13 sts = 4"(10 cm); 8 rounds = 3½" (9 cm) in pattern. CHECK YOUR GAUGE. Use any size hook to obtain the gauge. (4 Medium) RED HEART® Holiday®, Art. E759 available in 3.5 oz (100 g), 235 yd (215 m) balls. dec (decrease) = draw up a loop in next 2 sc, yarn over and draw through all 3 loops. Round 1: With A, ch 2; 6 sc in 2nd ch from hook; do not join but work in continuous rounds. Place marker in first sc and move up each round. Round 2: [Inc] 6 times – 12 sc. Round 6: [Sc in next 4 sc, inc] 6 times – 36 sc. Round 8: Sc in back loop of each sc around; remove marker and join to first sc; TURN. Round 9: Ch 1, dec, sc in next 19 sc, dec, sc in last 19 sc; join; turn – 40 sc. Round 10: Ch 3, skip first st, dc in next st and each st around changing to B in last st; join with a slip st in top of ch-3; turn. Carry unused color inside bag as you go. Round 11: Ch 1, slip st in slip st, dc in next dc, * slip st in next dc, dc in next dc; repeat from * around, changing to A in last dc; join with slip st to first slip st; turn. Rounds 12-29: Repeat Rounds 10 and 11. Round 30: Repeat Round 10 but do not change color. Continue with A only. Eyelet Round 31: With A, ch 4, skip first 2 sts, * dc in next dc, ch 1, skip next dc; repeat from * around; join with a slip st in 3rd ch of ch-4; turn. Rounds 32-34: Ch 3, skip first dc, dc in each dc around; join; turn. Fasten off at end of Round 34. With A, ch 75; slip st in 2nd ch from hook and each ch across. Fasten off. Weave through Eyelet Round 31. Wrap B around a 3” (8 cm) board 45 times. Tie loops tightly in center. Cut and trim ends. Attach a pompom to each end of tie. ABBREVIATIONS: A, B = color A, B; ch = chain; dc = double crochet; mm = millimeters; sc = single crochet; st(s) = stitch (es); * = repeat whatever follows the * as indicated;  = work directions in brackets the number of times specified. If you'd like to see more holiday patterns, take a look at the new "Have a Red Heart Holiday: 20 Knit & Crochet Gifts and Decorating Ideas" eBook from Red Heart Yarns.